What does “Cooperative” mean? What is a Coop? 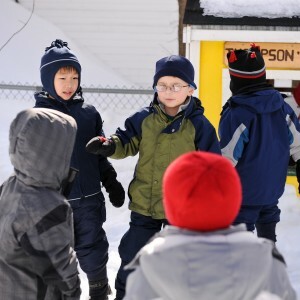 A cooperative school is a fabulous way to get involved in your child’s first school experience. The parent quickly gets to know the child’s friends and their parents by helping in the classroom. The parent also gets to know first hand his/her child’s teacher and her individual style. By being involved, a helping parent can ask better informed questions about his/her child’s day, and separation problems may be minimized. And last, but not least, children love to have their parents come to school with them. Most Coop parents would agree the amount of time spent “working” at our preschool is well worth the effort. How much money is my family expected to fundraise? None. The Coop’s budget is prepared without taking into consideration money raised through fundraising. Any money raised is used for additional curriculum materials, improvements to the class rooms and facility, and scholarships. Because we use the donations the year in which they are raised, your money helps to better your child’s experience. Helping Days: approximately 6-7 times per year. Come 15 minutes early, provide a healthy snack for the class, help teacher with class and clean up. Committee Service: each family serves on one committee (fundraising, maintenance, sewing, hospitality, health, etc.) Committee members are usually only called once a year for help. Fundraising: each family will be encouraged to support a fundraising activity to the extent that they are able. Parent Meetings: we ask that one parent attend the four meetings per year (August/September Orientation Meeting, November Wine & Cheese Party, February Budget Meeting, and May Election Meeting). Can I bring siblings when it is my turn to volunteer? If not, who watches my kids? Parent helpers with infants are allowed to bring the infant to class. Other siblings should remain home. Mom, Dad, Grandma, Auntie, etc are all allowed to be the volunteer helper (CORI form needs to be completed by anyone helping in the classrooms). Often parents will take turns watching siblings. Your Coop child has a special day at school, and the sibling has a special play date at another family’s home. We have numerous events throughout the year for parents to get to know one another: summer class-specific play dates, class coffees, monthly Mom/Dad Nights Out, and Wine & Cheese Party. Siblings of an appropriate age, and completed paperwork, can attend Monday morning Enrichment or Afternoon Adventures. Some parents choose to find a babysitter. Are you affiliated with the West Acton Baptist Church? No. The Acton Coop is a parent-operated, non-sectarian, non-profit corporation. The WABC has generously rented us space since 1973. The rented space is only used by the school and not for church-related activities. Do you have any extended day programs? We offer three programs that allow you to extend your child’s day: Enrichment, Afternoon Adventures, Lunch Bunch and Early Morning Drop Off. Enrichment/Afternoon Adventures is offered Monday AM 9:15 – 11:45, and Monday through Friday 12:00 – 3:00 for a cost of $30 per session. Children bring snack and lunch (if attending an afternoon class) on Monday morning (snack) and lunches for the afternoon session. Lunch Bunch is offered on Tuesday and Wednesday afternoons from 11:45 – 1:15. Children bring a lunch. The cost for this program is $15 per session. Early Morning Drop-off program on Monday through Friday from 8:30-9:15 AM. The cost is $10 and is paid for on the day it is used. A typical day looks something like the following; however, days are subject to change based on special events, field trips, special projects, etc. Most children can attend school with cold symptoms as long as they do not have a fever. A sore throat with a fever, swollen glands, headache, stomachache, or rash may indicate strep. Children with fevers over 100 degrees should not be sent to school until they are fever free for 24 hours without the aid of medication, such as acetaminophen or ibuprofen. A child with vomiting and/or diarrhea should be kept home until the symptoms have resolved for at least 12 hours. The child should also be able to eat and drink normally before returning. Your child should stay home if he/she has red eyes that itch and/or have crusty discharge. Your child can return to school after 24 hours of antibiotic treatment. We have a family vacation planned. Is it OK if my child misses a week of school? Yes. Please notify the Director and your teacher of any pre-planned, extended absence. My child has allergies. What are your policies to keep my child safe? We ask that nothing containing peanuts or tree nuts be brought to the school. Teachers have access to their students’ emergency medication at all times. We work with the parents of the allergic child to make sure the classroom does not have any materials that could harm their child. Whenever possible, parents help to create safe snack lists so that all children feel included.